The Single Use Cell (S.U.C.) is designed to optimize separation, purification, concentration and formulation processes in disposable chromatography and ultrafiltration systems. Cross-contamination between products and batches will no longer be an issue as gamma irradiated Single Use Cells decrease the risk of contamination to virtually zero. The S.U.C. is available in five different designs. Two versions are primarily for pre-column chromatography measurements (SUC 01/03) two versions for post-column measurements (SUC 05/07) with optical windows for optek UV sensors and one version for purely optical measurements (SUC 04). Each S.U.C. is clearly labeled with data specific to that particular cell. This data includes the sensor constant of the conductivity sensor (not for SUC 04), as well as the UV OPL (optical path length) adaptation data (only for SUC 05/07). Integral parts of the S.U.C. system include the holder and locking mechanism guaranteeing proper installation. There are three different types of holders available. 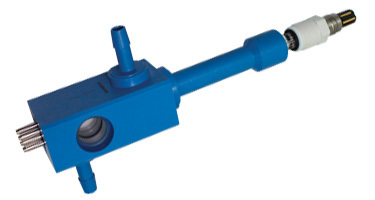 The Holder Pre (SUC 01/03) and the Holder Post (SUC 05/07) come equipped with the conductivity sensor ACF60-SU-35 for easy and fast installation into the process instrumentation. 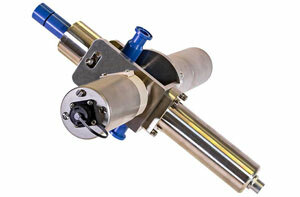 The Holder Opt is designed for use with the SUC 04 for optical measurements. SUC 03 and SUC 07 are equipped with the pH adapter, which is compatible with a broad variety of standard pH electrodes (Ø12 mm x 120 mm). When no pH adapter is required (for SUC 01 and SUC 05) a plug is used to cover the pH input. This pH plug has the same dimensions as the pH electrode, keeping the hold-up volume minimal. The versatile design of the optek S.U.C. has been developed to meet the specific demands of biopharmaceutical manufacturing. With low hold-up volumes and easy installation they are fully compatible with the optek range of UV, NIR and color absorption sensors. Cleaning with standard cleaning agents (alcoholic surface disinfectants, quaternary ammonium compounds) is permitted. Caution! Ensure that windows are clean and dry and the contact unit for the electrodes is dry before starting measurement. The plastic and elastomeric wetted parts of the sensor have passed the bio-reactivity tests according to USP <87> and <88> Class VI and comply with FDA Regulations 21 CFR 177.2600. All wetted parts are of non-animal origin and any materials of animal origin or containing animal substances are not used during manufacture. All wetted parts are of bovine-free origin and any materials of bovine origin or containing TSE have not been used during manufacture. 0 - 6 bar (0 - 87 psi) May be reduced in combination with pH probe. Refer to corresponding instruction manual for specifications of pH probe. 2 - 50 °C (35.6 - 122 °F) May be reduced in combination with pH probe. Refer to corresponding instruction manual for specifications of pH probe.